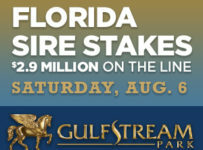 For the third straight year, HorseracingFLA’s suggested bets on the Preakness Stakes (Grade 1) resulted in a profit of at least 40 percent. Our streak continued Saturday, when anyone who made all of our recommended Preakness bets would have received a 55 percent return on investment. That followed a return of 56 percent on our recommended 2014 Preakness bets and of 40 percent on our suggested 2015 Preakness bets. *A Win/Show bet on Preakness winner Exaggerator. *A four-horse exacta box that had Exaggerator and Cherry Wine. Nyquist and Stradivari, who came in third and fourth, also were in that exacta box. *A trifecta part wheel with Exaggerator. Cherry Wine and Nyquist were among horses in the right holes. Details of our bets may be found in the article “Our Preakness Recommendations” that we published yesterday. The winning bets included a win ticket on Nyquist, the exacta with Nyquist and Exaggerator and the trifecta with Nyquist, Exaggerator and Gun Runner. In Saturday’s Preakness we used our usual hedge-style strategy, with small denomination wagers for individuals and groups that have betting budgets. We recommended $64 in bets, that paid a total of $99.35. That included $1 exacta and 50-cent trifecta bets. If someone with more cash had made those bets ten-fold, the total would have been $640 for payoff of $993.50. That would have amounted to a hedge-betting profit of $353.50. A key bet on Saturday was a hedged 50-cent trifecta part wheel for $15.00. It paid $36.55. We had Exaggerator (5-2) and Nyquist (3-5) in the win hole. We had those two horses plus Cherry Wine (17-1) and Stradivari (8-1) in the second spot. We had those four horses in the third hole – along with Collected (14-1), Lani (30-1) and Fellowship (58-1). Stradivari came in fourth, a half-length behind Nyquist. Lani finished fifth, another length back. If Stradivari (8:1) had caught Nyquist for third, our $15 bet would have paid off for several hundred dollars. If Lani (30:1) had finished third, the payoff would have been considerably higher. That’s because the payouts are figured by the bets on those horses, and the losing horse pool money (if it’s a favorite with lower odds), all gets funneled into the higher odds horses, resulting in noticeably larger payouts. For instance, in the exacta wager, a Nyquist / Exaggerator win payout would have been considerably lower than the $44.20 paid on a $1 wager as Cherry Wine at 17:1 nipped Nyquest at the wire. We were fortunate and prescient to include Cherry Wine into our 50 cent trifecta and $1 exacta wagers. 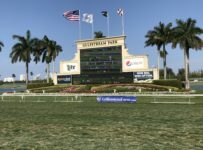 We will have recommended bets again for the Belmont Stakes on June 11 and on several stakes days this summer at Gulfstream Park.